When people hear I write a cooking blog, they ask what cuisine is my speciality. When I respond that I cook everything and don’t really have a speciality, I can see they don’t believe me. Really, I like to cook as wide of a variety as I can. Growing up, my parents gave me an appreciation for all different kinds of food and I think I have taken it to the next level for my family. I’m not the only one that feels this way. 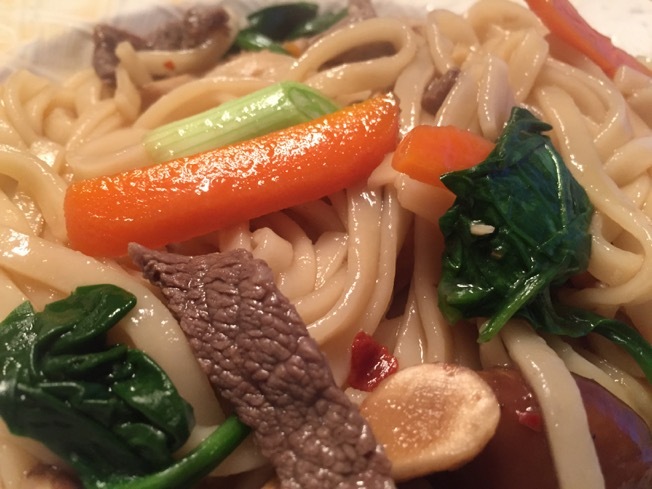 Last January, NPR highlighted a group that is intending to eat their way through the cuisines of the world. I wonder if they would invite me to the table…. Take a look here. Speaking of global cuisine, this dish hails from Japan. 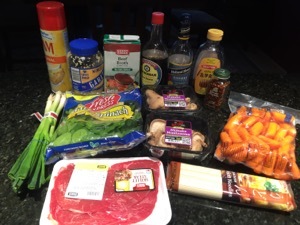 Thinly sliced steaks is important for the quick cooking. 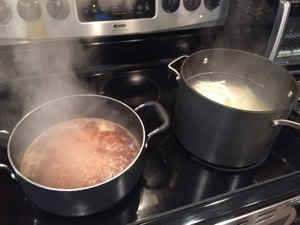 Two pots going at once. Getting the shrooms and carrots going. 1 cuisine down. 179 to go. Place garlic, pepper, and broth in a large saucepan. Bring to a boil; reduce heat, and simmer 10 minutes. Combine soy sauce, sake, and honey in a small bowl; stir with a whisk. Heat a large nonstick skillet coated with cooking spray over medium-high heat. 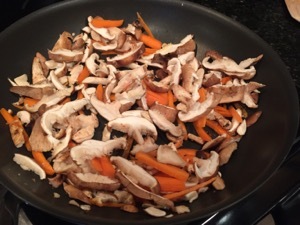 Add mushrooms and carrot; sauté 2 minutes. 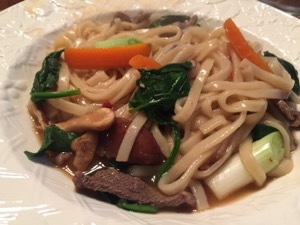 Stir in soy sauce mixture; cook 2 minutes, stirring constantly. Add vegetable mixture to broth mixture. 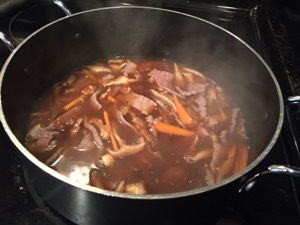 Stir in beef; cook 2 minutes or until beef loses its pink color. 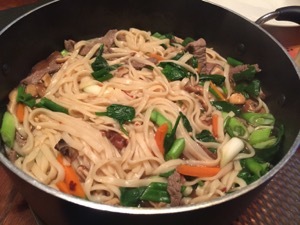 Stir in noodles, green onions, and spinach. Serve immediately.